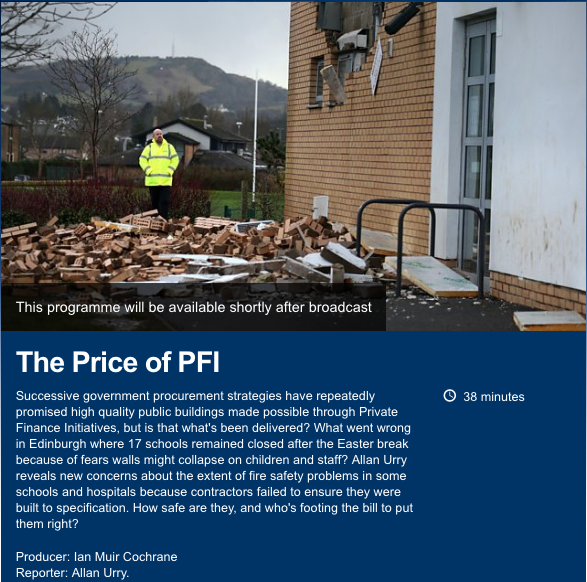 The Price of PFI on BBC File on 4 features exclusive research by members of The People vs PFI exposing systemic failures in building and fire safety standards in public schools and hospitals constructed via Private Finance Initiative (PFI). 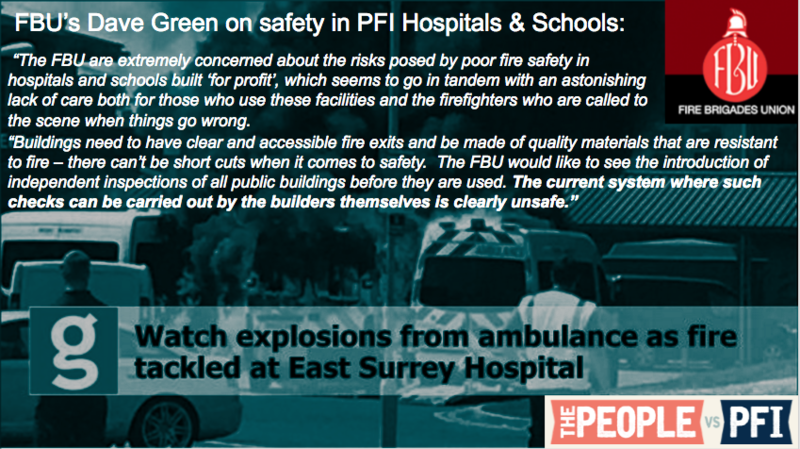 Schools in Edinburgh and Merseyside and hospitals in Manchester and Peterborough built without key structural elements and fire safety compartments, placing staff, students, patients, and fire and rescue staff at unnecessary danger in the event of fire, denying the opportunity to evacuate buildings safely. “The obvious downsides to handing control of a public asset to a private interest were supposed to be outweighed by quality. It’s clear that this isn’t true and we have paid through the nose for false comfort. Everyone who’s ever set foot in one of these buildings has been put at risk and we are truly lucky that people have not died. 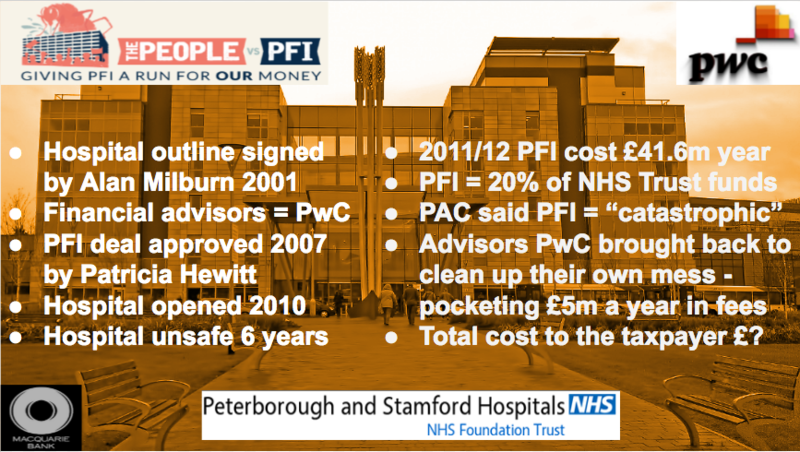 The Price of PFI visits a Hospital in Peterborough where 20% of the NHS Trusts income goes towards repaying the PFI loan for a Hospital that does not even meet basic fire safety standards. 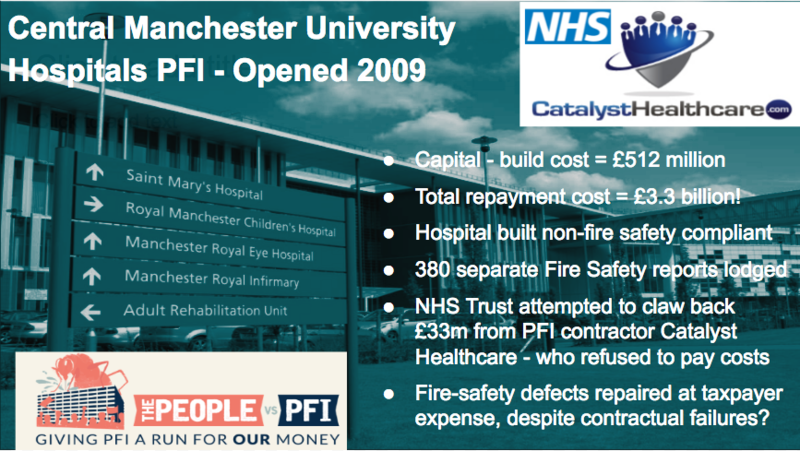 In Manchester, the Central Manchester University Hospital is repaying £3.3billion for its PFI Hospitals, despite 380 documented fire safety failings which the contractor Catalyst Healthcare refuses to take financial responsibility for, dumping further costs on local taxpayers. At Oxgangs primary School in Edinburgh, 17 schools were closed and lives seriously endangered when falling masonry struck Oxgangs primary school during storm Gertrude. Builders Miller Construction forgot to add wall ties. 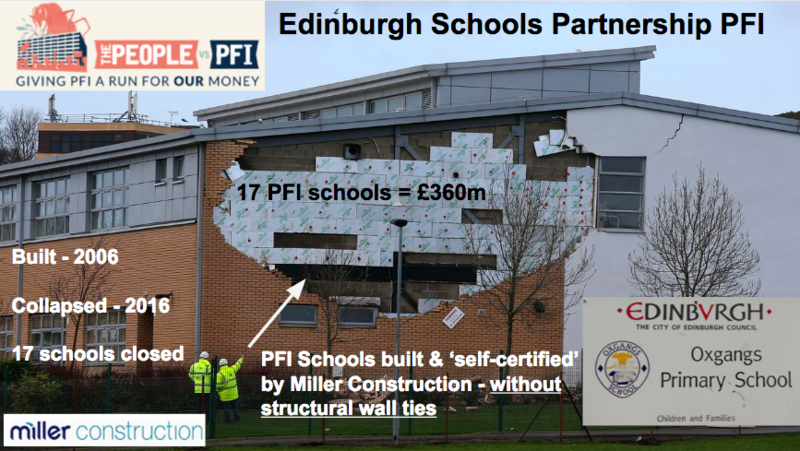 PFI allows building contractors to mark their own homework, approving their own deficient work through a process known as “self certification”. PFI is a failed infrastructure policy and citizens lives should not continue to be endangered needlessly. We need an immediate review of PFI safety standards, full transparency of PFI contractual documents and a new model of public infrastructure that does not put private profit before public safety.